Before FTL tech had made it to Vinge’s Zones of Thought universe, a human ship ventures deep into the slow zone to exploit explore the secrets of the mysterious On/Off Star. While the “spider” species inhabiting an orbiting planet provide one of humanity’s greatest discoveries, the crew quickly realizes the ship is harboring secrets of its own. I had high expectations for Vinge after his first Hugo win, and A Deepness in the Sky did not disappoint. I read close to 90% of this book during our incredible vacation to Minnesota this summer and the fact that I was able to read so much of it on what was an insanely busy, fun, and beautiful trip should also speak to the quality of A Fire Upon the Deep’s equally masterful follow-up. Despite being different books, they share more than a few similarities. Humans trapped in a remote piece of space. Cool tech that fundamentally changes the way people live. There is another previously undiscovered alien culture which is surprising for its familiarity and weirdness all at once. The On/Off Star provides another astrological oddity. And of course, there’s an unexpected, and in the end beautiful, entanglement of human and alien cultures and problems. That the two books are similar isn’t a problem for me though. I still like A Deepness in the Sky for a lot of the same reasons that I liked A Fire Upon the Deep, and they are each separately great works of science fiction so I’m not all that bummed that some themes are mirrored in this one. A Deepness in the Sky reinforces how robust we all thought Vinge’s “Zones of Thought” universe was in his previous Hugo winner and satisfied a serious itch to go back there. That these two books may be thematically similar is a problem that we should be celebrating. And beyond that, we can celebrate the spiders. If nothing else, A Deepness in the Sky solidifies Vinge as one of the greatest creators of alien species in all of science fiction (I certainly haven’t read enough SF to actually make this claim but I’m convinced anyway). He does this thing where you get to spend extended time with the creatures but it’s a slow reveal anyway. In A Fire, early on when I already loved the dogs but then realized that they weren’t really just dogs or wolves, they were so much…cooler, it literally made me drop the book. And throughout the entire book Vinge gradually gives up more and more about the species, each new reveal forcing readers to make serious structural changes to the beings taking shape in our heads. The same thing happens with the “spiders” in A Deepness in the Sky, only times infinity and right on up until the final pages. It is really something to behold. For some reason the spiders didn’t quite have the same awe factor that the Tines did as a species, but I had a more intense connection to individual spiders like Sherkaner Underhill, than I did to with any individual Tine, even if I wasn’t as captivated by the species as a whole. And that’s what makes A Deepness in the Sky so unceasingly readable. Vinge’s treatment of aliens alone makes each of the Zones of Thought books magnificent. And that’s just one of the hundreds of truly brilliant ideas included in this story. Read A Fire in the Sky first and then come here. It wasn't my favorite of the two but this is still Required Reading. 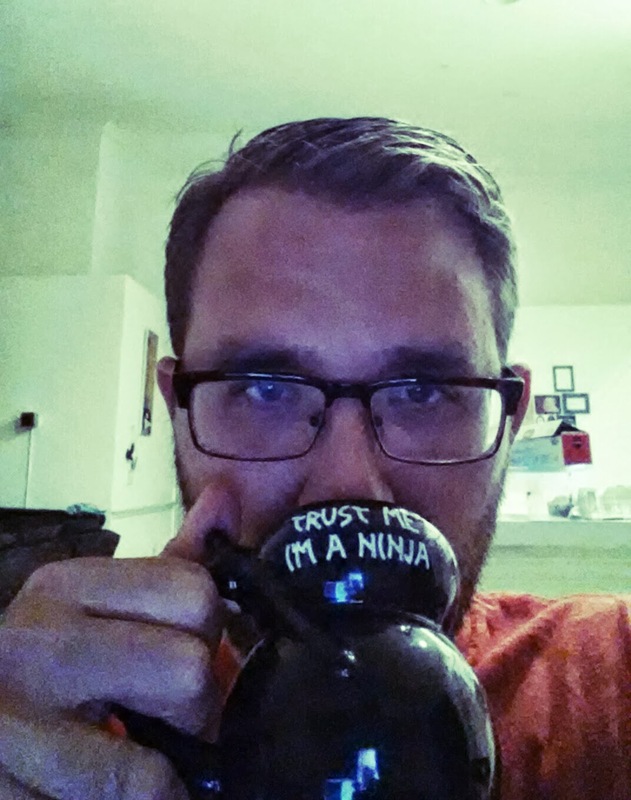 Last night, I was feeling pretty …meh… about 2013. When I mentioned this to Ali, she thought I was crazy, and I’m glad I’ve sat down to write this because it made me feel better. Still, most of the things that make me happy about 2013 also make me a little bit sad, so there’s plenty to feel meh about. I began 2013 still feeling really happy about finishing the marathon in 2012. But I completely failed to run much in the past year. I hardly exercised in general for that matter. This is pretty disappointing. After running over 300 miles in 2012, I’ll bet I ran for a maximum 20 miles in all of 2013. I have my (poor) excuses, but they didn’t keep me from gaining 20 pounds in 2013. Obviously, one of the things that made me happiest in 2013 was finishing the Hugos. Despite that it’s not much of an accomplishment, it felt like one to me and even though it took me longer than I had set out to take, I was still pretty proud of myself for having seen this challenge through to the very near end. But then I’ve really stalled on completing the reviews. I’m going to try to get on the way to finishing though, and I’m into the last ten reviews so it should happen soon. And although I finished the Hugo’s this year, I did not read much at all (outside of school). To be fair, I am a full-time grad student and employed full-time so I feel like I have something approaching a legitimate excuse here. Nevertheless I feel pretty bummed about my reading stats from the past year. For the first time ever, I actually listened to more audio books than I read in print. I like to keep track of some stupid reading stats, but it’s mostly just to help me remember and reflect on the books I’ve read. I keep spreadsheets for everything, so you can see my embarrassing stats below: 14 print books. Being 3 graphic novels and 1 young adult. 10.15 days listening to audiobooks. There are some things I feel unequivocally happy about from this past year: I’m working toward a master of arts from the University of Florida. I FINISHED READING ALL THE HUGOS! We took a spectacular vacation this summer to my home state of Minnesota where my 4yo daughter met my grandparents for the first time. My wife and I celebrated our fifth wedding anniversary (we started dating in high school over ten years ago). Vote for the 2014 Hugo’s! Well, this is getting long so I think I’ll save more (favorites of 2013 and maybe some pictures) for later… Good luck to you all in the new year! Dowager Royina Ista, previously cursed and so profoundly grief-stricken as to be marked as mad, sets out on a religious pilgrimage, intending to right herself in the world once again. A different kind of madness ensues. 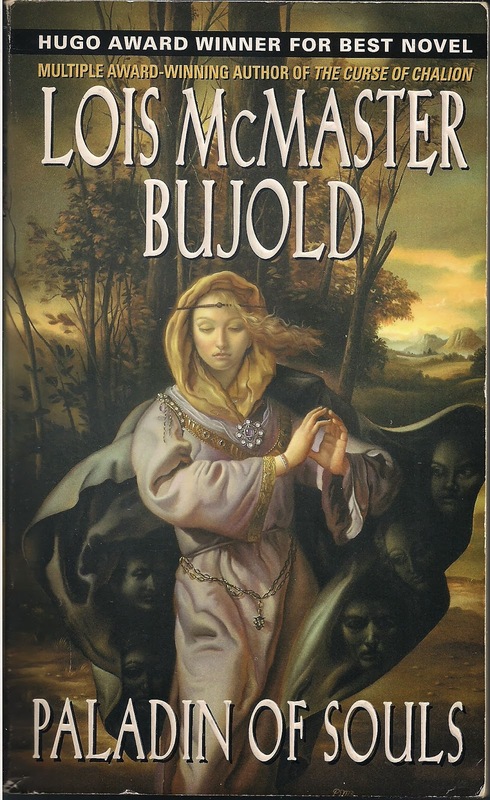 The most compelling aspect of Paladin of Souls is the part of science fiction and fantasy that Bujold does so well. Ista is a wonderfully conflicted, funny, and smart female protagonist who struggles to know her gods and the people around her in a way that is at once completely foreign and weirdly unsettling, yet also totes-compelling, human, and eerily familiar. people will literally chop your gods-damned head off. 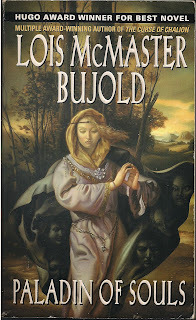 Knowing what we know about Bujold’s skillz in her other Hugo winners (there's a Bujold Skillz meme in here somewhere...), and considering even just a short list like that, are you prepared to say you don’t want to read this book? As I do best, I have jumped into the middle of a Lois McMaster Bujold series. And as has been the case in the past, it doesn’t seem to matter much. I’d say as far as my enjoyment of the Hugo’s goes, I’d lump this in with any of Bujold’s other winners. Which is to say that it was a pretty damn decent book and I liked a lot about it, but it also wouldn’t be the first book I recommend to someone wanting to break into the Hugos. Maybe reading them out of order has caused some problems again, but I don’t think so. Paladin of Souls is good as a stand-alone novel. Paladin of Souls is one of just few of what I have come to think of as the Spiritual Hugos in which dealings with a divine being or matters dealing with spiritual practices take precedence over other more traditional SF & F elements. I have tended to like these books, but not really love them and that’s pretty much what’s happened once again. Everything about Paladin of Souls appeals to me on a conceptual level and I really want to love every page, but it doesn’t ever elevate itself beyond just the sum of its parts. If you were a fan of Barrayar, this would be another great read. In fact, Ista was to me a character very much akin to Cordelia Naismith. If you thought Cordelia was maybe a little too ultra-confident sometimes, you won’t see that in Ista. However, while she seemed a little more rounded out as a character, she’s still been lumped the same exact space of my brain (my brain is just a tiny chest of drawers) and so have the two books. To be clear it’s a good space, but it’s also the same space as her other books. There is also a lot of horseback excitement. Which is to say that from a strictly level-of-horseback-excitement view, I guess Paladin of Souls is your clear winner. My last post was October. That is really bad. As you know I’m all caught up on the Hugos, but I’m still reviewing the last 10 or so. I’ll be trying to pick up the pace again. Also, I’m trying to finish the first Mouse Guard by David Peterson (a graphic novel) by the end of the year because my reading list for 2013 is pretty embarrassing and I need to spice it up at the last minute. Because that will change everything. Caffiene has never killed anyone...right? This was me preparing for a long night with inappropriate applications of caffiene well into darkness. I was writing, but unfortunately not reviews. The news that I actually wanted to share was that I am caught up again on the Hugos. I actually finished Redshirts...I don't know...maybe a week ago. I don't have any conception of time anymore now that I no longer have Hugos to tick off the passage of time against. Either that or my brain is busted. Hmm, yeah, it's probably busted. I just finished a really exhausting project so no caffiene tonight. Just sleep. But I should get to at least one review this week! I’ve read the Harry Potter series twice now and I always enjoy them as fun, familiar, and not very challenging. Preparing to read it in the context of all of the really great SF/F titles that have earned the Hugo, I was a little perplexed and to be honest, earnestly dreading this read (is it possible to dread earnestly? Because I was very intent in my dread). I would never admit to this, but there may have even been a moment in time when I sort of chose to listen to the audiobook so that I could only half pay attention and just be done with it with minimal effort. And I was even less excited about writing this review. Now, I’m glad I’ve taken some time to stew over it, because I’ve developed a slightly different perspective. Initially, I was concerned that the pendulum swing of voter fickleness (is that a word?) had swung from the very hard SF choices of the 90’s to what appeared to be little more than a popularity contest in the 2000’s (Vinge, Gaiman, Bujold, and Rowling, all with large fan bases, account for half of the Hugo’s). But really, that’s a silly comparison; after all, people like Heinlein, Asimov, Clarke, and LeGuin have been getting repeat wins since the beginning. My fear that Rowling’s win would only evidence the number of fans rather than the quality of the book was probably unwarranted as popularity has always influenced Hugo Award voting. But my concerns about the book went beyond popularity too. I joked that this was the same Harry Potter only darker. I’ll get to the darker part in a minute, but Rowling really does lean heavily on the safe and predictable at times. I wondered for a long time why this book won, if none of the others (which are written very similarly) had even been nominated? I have also been seriously delaying this review (earnestly delaying it), then writing and rewriting major portions of it for the last month or so, trying to decide what to defend (I think there’s plenty worth defending) and what to criticize (probably even more). But just now, I don’t think I’ll go there except to remember that if any book signaled Rowling’s attempt to transform this series to something darker, it was this one. There’s a lot that feels rote-Harry-Potter about this book, but even amidst really awful moments like the entire World Cup Quidditch Cup, Rowling was able to introduce a sense of pervading and seemingly permanent doom. 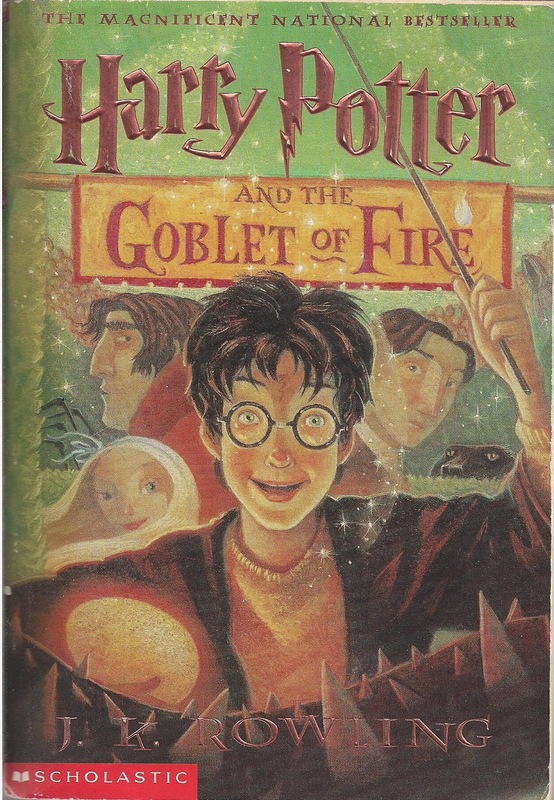 Harry Potter and the Goblet of Fire shed quite a lot of the happy-go-lucky, even-if-something-bad-happens-it-will-turn-out-alright-in-the-end feeling of the first three books. Rowling’s fourth installment had some real weight (physically too), and even a sliver of emotional depth. In all fairness, it’s not entirely undeserving (just mostly). So I guess, while it might seem that I could get behind arguments in favor of- or in opposition to- this win, I think I still lean toward being opposed to this win. At the same time, I’m of the opinion that the question of whether this or any of the Harry Potter books are deserving of the Hugo is irrelevant. That Harry Potter won the Hugo seems to say more about the award process to me than the worthiness of the book. The Hugo Award, at least for best novel, is only marginally about the crowning of this year’s best SF/F work. It’s a fan process. It’s a thing anyone can do (if you can pay). It’s a popularity vote. And yet, we also know that people are supposed to be voting for the “best” of the year. I don’t think any of that is bad necessarily, but I think it’s probably necessary to remember before starting to read Harry Potter and the Goblet of Fire in the context of quite a few really distinguished SF/F novels. It might be a little more fraught with questions of legitimacy (rightfully IMHO), but it is still fun, immersive and sometimes a little gross. If you’re trying to finish off the Hugo list like me and, like I was, regretting this one, just know that despite being a little miffed about this Hugo, I still think there’s plenty to enjoy. Overall, I enjoyed the book. Not my favorite HP, definitely not my favorite Hugo, but still worth the time. If you’ve already gone through the print books and you think you want to read them again, I recommend giving the audiobooks a shot. Jim Dale is always great, and he has such a Harry Potter-y voice that he’s doubly good here. Hey! In case you didn’t notice, I actually finished the Hugo’s just a few hours before Redshirts was announced this weekend. I considered that a challenge completed, though I have already started reading Redshirts, and I’m sure I’ll end up reviewing it here later. Well, I guess I won't get to enjoy this view (below) for much longer. Congratulations to ALL the Hugo winners who are not reading this! I've still got to get to a number of reviews yet, and I feel like I still have a lot of other thoughts that I've been meaning to take down here, but right now I'm still feeling like I've completed something. Combined with the excitement of the streaming Hugo Award Ceremony and the all the pictures and status updates from LoneStarCon, I'm feeling pretty happy. Gee, having finished all the Hugos sure made this year's announcement feel different. Now off to the library to get Redshirts! Oh wait, it's Labor Day... TOMORROW THEN! For those of you who have been aching for me to finish this damn thing already, your wait is almost over. I'm reading the very last Hugo. 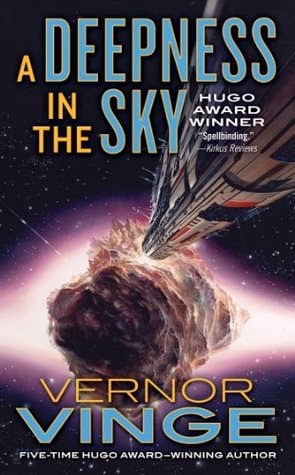 A Deepness in the Sky by Vernor Vinge. In between semesters I hope to get a few of these reviews done that have been waiting and soon this will be over. Sad. Happy. It's been so much fun. I wish I had read Among Others last, it would have felt very fitting somehow. Oh well, only about 600 pages of Vinge to go now. I hope you're all having a great summer (all two of you...including my Mom). FYI this count isn't entirely accurate since it doesn't include All Clear, which I am currently listening to. Other than that, the last two are A Deepness in the Sky and Among Others. I recently mentioned that I have backed off my original goal for finishing the Hugos. I also thought I might have a better idea of how far off I am. It took me nine weeks to read Jonathan Strange & Mr. Norell. It was an extraordinarily long book, but it wasn't nine weeks long. While I was reading it, I was also studying for the GRE and I may have watched an episode or two, or a season, of Downton Abbey when I wasn't jamming books in my face. Now I have found myself back in school, still working, still a dad, and with just over a handful of Hugo's left, some of them being nearly as ridiculously long as Jonathan Strange. That is to say, I've taken too long to finish the Hugo's and now I'll have more reading with more urgent deadlines and all of my usual things to do and a lot less time to fit the Hugo's in. I had originally envisioned that I would go back to this year, but I had also thought I would be done with the Hugos by then. Ha! So, how do I now approach these final Hugos? Well, to start, I should explain that I am a slow reader, or I should say that I am a careful reader. I read and re-read passages that are confusing, enlightening, awkward, or just rad. I stop and think. I drink a little wine. I figure reading a novel should be taken seriously and approached with the same gravitas that any thousands of years old craft deserves (kind of makes you wonder why I started this challenge right?) Okay, sometimes I read while Emmeline watches Powerpuff Girls or My Little Pony, but when I can, I like to have all my things arranged and I like to dig in. This challenge aside, I take forever to read even the shortest books and I like it that way. When I started this challenge, I finished each book with days to spare. I was psyched, the books were shorter, I was staying up until all hours of the night and operating during the day on a tiny, coffee fueled replacement brain. Since then the books have grown longer, I've taken on more commitments, staying up past midnight has become a death sentence, my brain is real (and still tiny) and I've had trouble getting through any book in under two weeks. Erg. With that in mind, my first thought was to just finish them out via audiobook, because it's possible that I could end up reading these until the end of time, but that's out because they aren't all available at my library. Also, apart being a little disappointed about not meeting my self-imposed goal, I'm not terribly depressed about the idea of continuing this for a little longer. I don't know yet how easy it will be to balance my required reading and my Hugo reading, but with just few to go, I don' t imagine it will take me more than a few more months. I might take a while to finish the longer books and my posts might be a little irregular for the first few weeks, but hopefully I'll get into a groove soon and everything in the entire world will be perfect. Let's plan on that. And if all else fails, instead of "64 books in 64 weeks", The Hugo Endurance Project will just have to mean that I'm "reading books to death". It might be a confusing goal at first but I assume the autopsy will clear it right up. After medical treatments make it possible for Alzheimer patients to completely recover, Robert Gu finds himself in a pretty intensive rehab program. He isn’t the person he used to be, and he doesn’t live in the same world either. He was a famous poet in a world similar to ours. Now he is no one, learning how to “sming” and how to interface with computers. It is during his rehab at Fairmont High School, that Robert becomes embroiled in a conspiracy plot to end all conspiracy plots. So there is one reality where an author has an uncanny ability to tap into the most salient features of some really complex issues. In Rainbows End, Vinge reminds us how well he capitalizes on our most deep-rooted fears and our most lofty scientific achievements. In beginning this book, I had figured Rainbows End for another goldmine of Vinge-y, SF goodness…but I didn’t labor under that delusion for long. I was excited by the opening computer/chemical warfare plot. I was reminded of the cyber-attacks on nuclear facilities in Iran going back a couple of years and I thought Vinge might have been preparing to go bigger. I was strapping myself in for Vinge’s brand of ultra-paranoia. It harkened to the message boards in A Fire Upon the Deep and man…I ate that stuff up. In the first chapter, “Mr. Rabbit visits Barcelona” (Sweet title. I loved it), Vinge was poised to capitalize on how compelling and/or dangerous the convergence of several technological advancements could be in a world where anonymous access is taken to just about every extreme, and I was ready to follow him wherever he wanted to go. Taken separately, individual elements of Vinge’s future were awe inspiring, but the other reality of Rainbows End is that as these elements come together and the story starts to drag on and on, the final product doesn’t seem equal the sum of its parts. I almost think this is worse than having just written a story that falls flat altogether. Vinge touches on all the right topics and sets himself up for a home run, while everyone is batting blindfolded. Instead of just striking out, as authors do sometimes, in Rainbows End, Vinge lets go of the bat and injures some unsuspecting kid in the stands hoping to catch a foul ball. And I think I might have been that kid, because this one left me confused. While I admit to exclaiming audibly at the coolness of this or that bit of tech or social construction quite frequently, I didn’t much enjoy the overall story. Tension? Not so much. Compelling characters? Nope. Cool world, but there was never any reason to be in it. Consistent with my last Vinge experience, Rainbows End incorporates a plethora of themes both scientific and psychological, and fantastically so, but it also lacks a lot. Comparing the two Hugo winners that I’m familiar with, Rainbows End feels like it occupies a specific place and time in a way that A Fire Upon the Deep did not. I don’t have much interest in re-reading this one, but I am curious how it will hold up to another ten years or so. I might be wrong; it could be like good wine. I actually started this review several weeks ago and before I chucked everything I had and started again, I noticed that this audiobook was only fourteen hours. Not terribly long as far as audiobooks go, but it felt longer than some of the longest I’ve gone through so far. I guess even though the concepts were interesting, they only had the power to captivate for so long. Perhaps I’ll enjoy the shorter stories that Rainbows End was based on instead.